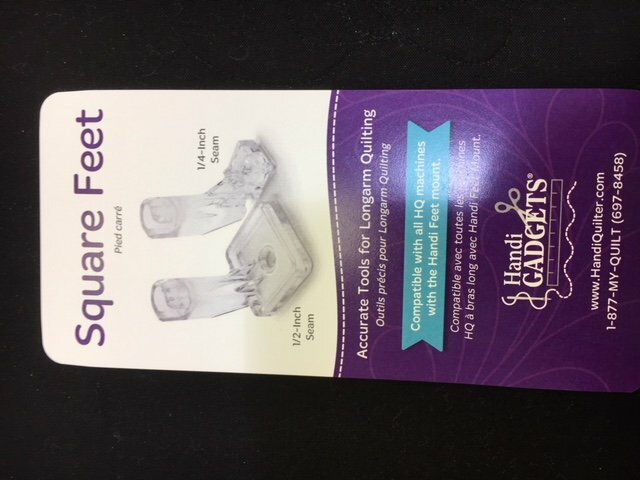 Home > HANDIQUILTER PARTS/ ACCESSORIES > HQ SQUARE FEET - NEW! HQ SQUARE FEET - NEW! This set of feet was introduced at Spring Quilt Market 2018. Square feet are designed to aid in achieving straight seams while piecing on your quilting frame. These feet can be used as a guide for consistent seam allowances such as bindings. IMPORTANT: If your machine didn't come already equipped with the HandiFeet mount, you will need to convert from the original hopping foot to the HandiFeet mount using the HandiFeet Conversion Kit (QM00841).